Post a comment — Trackback URI RSS 2.0 feed for these comments This entry (permalink) was posted on Tuesday, January 18, 2011, at 12:00 am by Danilo Cesar. Filed in Linux, Maemo, Qt and tagged Linux, Maemo, musicians, n900, nokia, Qt. Does it honor the volume buttons? I tried to tone it down while playing with it in the office, but it seemed to always play the samples at the same volume. Any particular reason this package isn’t optified? You’ve got almost 1 MB in the root filesystem. @Michael: This problem with the volume happens only in a few devices. I don’t actually have a device to test it, I’m testing on friends devices =/ I’m not sure if it’s going to be fixed soon. I installed it and rebooted. I dont hear any sound though. I checked the system volume and its at 100%. Any solution to fix this? @Nithin: Could you please execute beatmaker from command line and check if there’s any error/warning message? Sorry i a noob with xterminal. Could you please tell the command to run beatmaker from xterminal. I have root enabled. Great app. How about adding an ability for a 3x beat (probably 6x would be better) for things like waltz. Also, would be nice to be able to control the bpm without going to the menu. Why volume is alway full 100% ? @dbrodie: We were thinking about that thing of the x3 or x6… Quite hard to implement, But also, should be solved with a higher BPM and a pannable drum area, do you agree? Also, do you have any suggestion about how change the BPM without going to the menu? (because of the GL stuff, our mixer gets slower during that). Maemo application must be run with run-standalone.sh script! Home director /home/user not ours. f you think i need to install something missing, please let me know. Thanks. 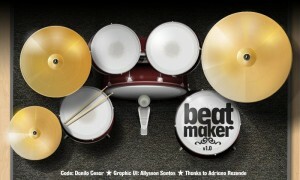 – the beat is not very constant while at higher BPM and when opening the menu ect. I uninstalled and re-installed again. Still no luck. Still no audio what so ever. Anything i could be doing wrong? As I found this package on the download section of maemo.org, with a request for testers, I guess I should be straight here. If this is version one, you really need to add some functionality. Pattern length, note length, etc. Also, judging by the sound of the quality, I´d say you have used 8 bit samples, which isn´t really enough. The crash sounds artificial and lacks high frequency, the bass kick lacks low range and so on. Big plus on the interface, though, but I prefer functionality over looks. Conclusion: keep up the good work but add, add and keep adding before bringing out version 1.x. And of course, I forgot to mention the complete absence of measures. No option to play a 7/8th note, or even a regular 6/8th means you limit your audience to pop musicians. If bugs reports are always welcome: I don’t see any link to a bugtracker mentioned here. For those who’re having problems with the volume. Some nice guys sent me a device so I will be able to fix this problem as soon I get it. @anthonie: The idea of the application is to be simple. I was discussing with Allison how to improve the application without making the interface too complicated. He’s thinking about that. Also, the sound is 16bits, but mono. I will try to upgrade it to 32/sterio and see if there’s any kind of lack of performance. About the timing with the menu opened. Blames 3D / clutter / whatever. I can’t think in a solution for that. @andre: you’re totally right. I was expecting to have just two or three replies here in the comments, but I should have a bugzilla, However gitorious doesn’t provide one. What do you suggest? Open a new project at garage? Congrats for the new release and keep up with the good work! The UI is really cool and the app is original. ps: As vezes o pessoal pega no pe, nao manda patches e reclama. Mas a gratificacao de fazer um pet project vale a pena! I have installed it, but I am not able to get it to work. It starts but the loop does not run. In your video I see the running light on top but on my device it does not work. I tried to STOP/PLAY from the menu multiple times but nothing happens. When I start the application from the command line, I see no messages at all. Just so you know, installed on an n900 running pr 1.3 and running perfectly! Thanks a lot! I am ready to pay something if I can set volume levels for each note and save sequenses to MIDI-file. I don’t know anything about MIDI files, and also I don’t have the test device anymore.